The SanDisk Connect Wireless Stick will initially be available only on Flipkart, four storage options upto 128GB, prices starting at Rs. 2,790. SanDisk has announced a new, wireless flash drive - the SanDisk Connect Wireless Stick. It lets users save and access photos and videos through other WiFi-enabled devices. The Connect Wireless Stick has storage spaces up to 128GB, and comes with an app that allows other devices to connect to it. It can be connected directly to a computer through USB, to transfer and save files, which can then be streamed to any device. The Connect Wireless Stick can support a single stream for up to 4.5 hours on a single charge. It will initially be available only on Flipkart, and will be available in 16GB, 32GB, 64GB and 128GB variants, for Rs. 2,790, Rs. 3,790, Rs. 5,790, and Rs. 9,490 respectively. 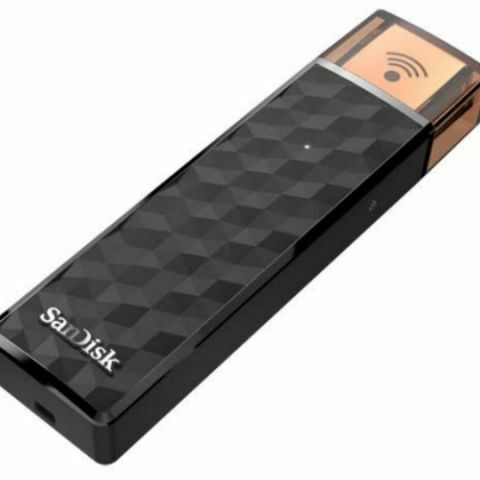 SanDisk Corporation (NASDAQ: SNDK), a global leader in flash storage solutions, today expanded its mobile storage portfolio with a new wireless mobile flash drive, the SanDisk Connect™ Wireless Stick. This new drive enables easy sharing, transferring and accessing of photos and videos between mobile devices and computers. Building on its award-winning SanDisk Connect Wireless family, the SanDisk Connect Wireless Stick features a higher capacity, up to 128GB*, a cool new app, and compact design – all at a great price. The SanDisk Connect Wireless Stick will initially be available at Flipkart and then extended to other channels in a phased manner by end of December. The SanDisk Connect Wireless Stick now gives consumers even more freedom to save and access photos, videos and other files from their favorite Wi-Fi-enabled devices1. As consumers continue to embrace premium mobile features such as high-quality photo capture and Full HD video, SanDisk’s new wireless storage device is designed to meet their quickly growing storage needs, at an affordable price. The availability of up to 128GB of capacity allows users to effectively double their mobile storage for greater flexibility on the go. The SanDisk Connect Wireless Stick works with smartphones, tablets and computers1. Whether in a briefcase or in a pocket, the new drive allows users to wirelessly access media or transfer large files; save and share photos and videos; or stream HD videos and music2 to and from mobile devices – up to three at a time. The SanDisk Connect Wireless Stick is capable of supporting a single stream for up to 4.5 hours on a single charge3. With its USB connector, users can also connect directly to a computer to save and transfer files instantly. The SanDisk Connect Wireless Stick delivers access that empowers users to take control of their content anytime, anywhere. The SanDisk Connect Wireless Stick features an intuitive app, the SanDisk Connect app, which enables nearly effortless management of content between people’s favorite devices4 including, iOS and Android™ devices; Fire tablets; and Macs and PCs – all via password-protected Wi-Fi connectivity. Available for download through the App Store, Google Play™ Store and Amazon Appstore for Android, the new app also enables other cool features like auto-back up of photos and videos from the camera roll to the drive. The SanDisk Connect Wireless Stick features a two year warranty5 and will be initially available at Flipkart.com in capacities of 16GB, 32GB, 64GB and 128GB at Rs. 2790/-, Rs. 3790/-, Rs. 5490/- and Rs. 9490/- respectively. What is the purpose of a flash memory device?